We got up early on sunday morning and attempted to do the Canopy zip-line tours. However after speeding past the place in the rain our short trip turned into a long “let’s turn around, it can’t be this far away” adventure. We ran out of time to do the zip-lines, because we had couples massages scheduled for 3:00. 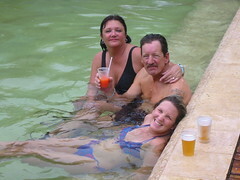 We hit the hot springs early, had some more drinks, then hit the spa for a little rubbing. After the massages we had dinner at the Tabacon restaurant and headed to bed early…it would be up early on Monday for our trip to Playa Tamarindo. This entry was posted in Costa Rica 2004 and tagged Arenal, costa rica by The Gordons. Bookmark the permalink.